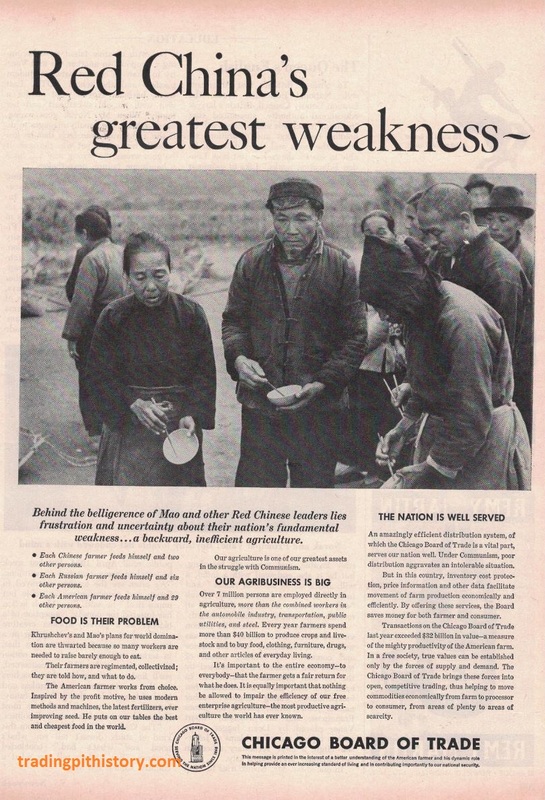 The CBOT ran a blustery ad in the mid 1960’s that illustrated the superiority of America’s free market agricultural economy over the absolutely disastrous Communist system which lead to widespread famine in China during the Great Leap Forward. In the years prior to this ad appearing, estimates ranging from 20-50 million (!) people starved in China as private farming was prohibited with the transition to inefficient communal agriculture. It’s absolutely chilling to read of the brutality and hardship which occurred during this period and anyone seeing this ad can’t help but pity the peasants standing in line with empty bowls, awaiting what is clearly some meager nourishment. Last year was the 100th anniversary of Communism and a WSJ op-ed appropriately regarded Communism as the worst catastrophe in human history due to the 100+ million whose lives it has cost. I’ve long been fascinated of Communist obedience and the ideology’s theft of human potential in stark contrast to myself being raised with the American values of freedom and opportunity. After visiting all the remaining current (except Laos) and many former Communist countries, I’m always still left with many more questions than answers. The high productivity of American agriculture can’t solely be explained by free market system enabling it, the USA is also blessed with an abundance of fertile soil, continuous arable land, numerous inland waterways and a temperate climate. Even Communists couldn’t manage famine with all the advantages America has geographically. One book that I’d really suggest for everyone to read, that was actually suggested to me by my roommate on a North Korea trip, is The Accidental Superpower. There hasn’t been a recent book I’ve read which has informed and shaped my views as much as The Accidental Superpower because the same geographic and demographic factors which shaped this CBOT ad are still relevant. 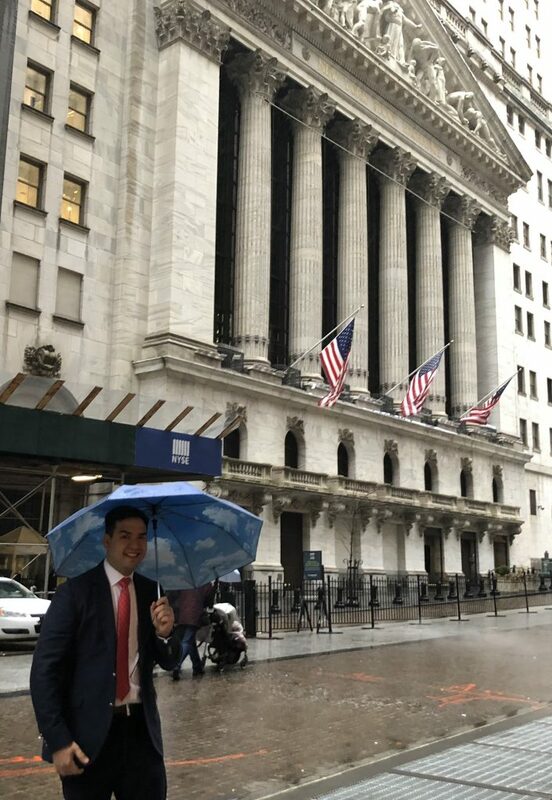 Visiting the iconic NYSE trading floor was something I’ve always wanted to do, but didn’t really pursue it since I’ve never been interested in the individual equities markets. I had gone to the NYSE viewing gallery in 2001, before it was shut post 9/11, although there is a huge difference between observing from the gallery and walking the actual trading floor. 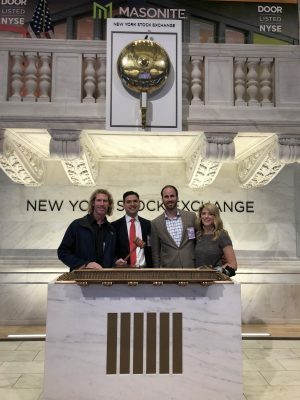 However last year, I was the high bid at a charity auction for a NYSE floor tour donated by ICE and made the visit recently in early March. Taking along two of my best buddies that I met through my career on futures trading floors really made the experience all the more special. 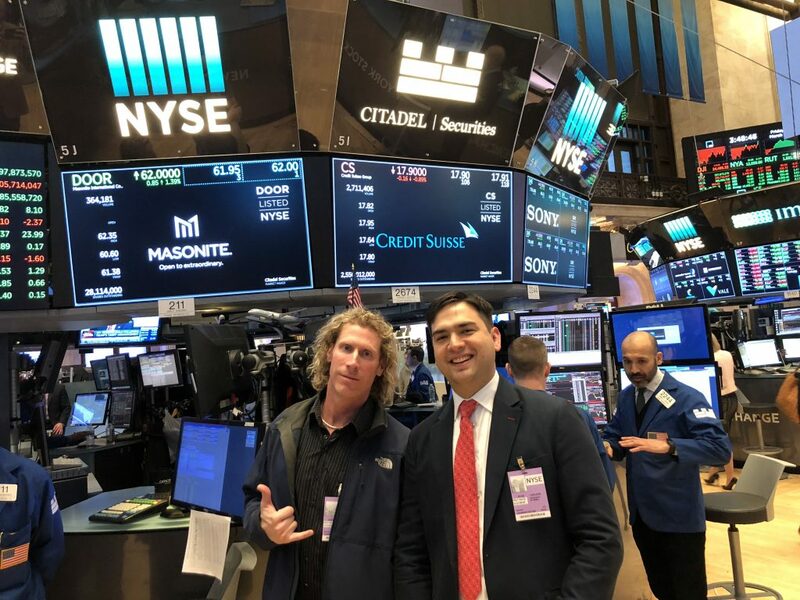 The staff at ICE who gave us the tour provided a lot of historical and contemporary insight to the NYSE trading floor and were excellent stewards of the organization. After proceeding through security, a number of historical documents and memorabilia were on display such as shown in the following photos. 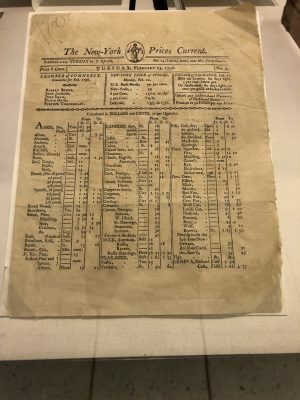 This issue of The New York Prices Current was published in early 1796 and listed market values for various commodities along with prices of two stocks, the Bank of the United States and the Bank of New York at the top of the sheet (click photo to enlarge). 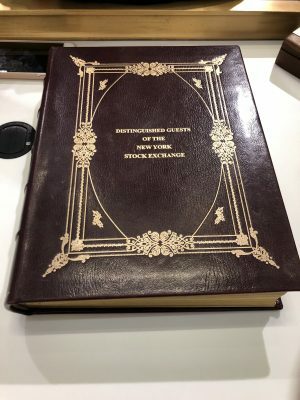 On display as well was the Buttonwood Agreement which set the foundation for what would eventually become the NYSE. We also dropped into what was the Stock Exchange Luncheon Club, now shuttered but still used as an event space. A mural depicting the signing of the Buttonwood Agreement underneath the buttonwood tree is displayed prominently in the space. In doing a little research before the trip, I came across the above photo which Neal Slavin nealslavin.com took of the NYSE floor in the mid 1980s and it does a great job capturing how populated the floor was at it’s height. I’m unable to find the article Mr. Slavin describes the photo but it was something along the lines of he spent 12+ hours getting the lighting to how he wanted it and only had a few minutes before the opening bell to take the photo. On the day of our visit, the closing bell was being rung by Masonite, ticker symbol DOOR, so we dropped by the post trading it for a photo. We got a chance to speak w/various people on the floor and while it doesn’t appear that they are very active most of the day, there are a few niches, including the close and IPO launches, which they still play a role for. A couple weeks after my visit, the WSJ wrote an article describing how the close now represents 26% of NYSE volume and some brokers now don’t even show up until after lunch. The closing bell is pretty much a spectacle to add excitement for a listed company, charitable cause or prominent public figures celebrating an achievement or anniversary. In reading the guidelines, they seem pretty strict to keep it to that certain profile and a quick look at the calendar here illustrates the types of organizations who are ringing it in the coming days. The history of the closing bell can be read here and a video of the ceremony on the day we visited can be viewed here. The bell is really loud as you might imagine since it was meant to be heard throughout the floor, once jammed with a population of thousands at it’s peak. 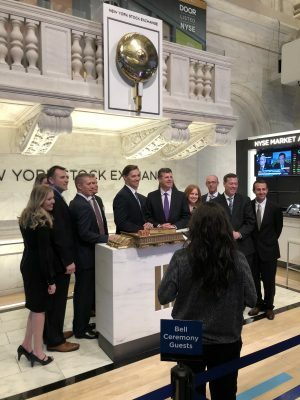 In the minutes before going to the upper podium, the closing bell guests stand beneath it for photos and to sign their name in the book of distinguished NYSE guests. Although we didn’t get a chance to get on the podium for the closing bell, we were able to get beneath it afterwards for a photo. There was definitely a lot of nostalgia on the trip for me since I started out in my Kansas hometown working for a couple stockbrokerages doing gruntwork as a teenager before starting to work on the KCBT floor at 18. Almost twenty years since I was last keying orders into a green screen Quotron to the same NYSE floor I was now standing on, it was great to be beside two of the greatest, most trustworthy people I met along the journey (and Christian’s lovely wife). One other reason for the trip to NYC was that my buddy Dan and I have had an ongoing bet for the past 15+ years of whoever has the highest trading P/L on the year has to pick up the tab at a huge dinner. For me it’s always been incredibly motivational to keep at it throughout the year and push for the honor of paying….and every year we talk about how grateful we are to still be in the game trading for ourselves. A few short videos of the LIFFE trading floor were posted earlier this year and are worth a look. The first video is of the Bund pit during the European morning session in September 1995. The second video is of the Short Sterling pit in a November 1996 afternoon. The final video involves some clowning around, after the bell it looks, in early 1996 that involves a couple costumed characters in the center of the pit, bidding a price the entire pit wants to sell. Someone recently uploaded this excellent 1987 documentary made by a local Chicago tv station about the Chicago trading floors. It’s certainly a must watch! Scanned below is an original packet given to members on November 2, 1999 from the CME which outlines the proposed demutualization of the exchange into a publicly traded company. Because I started as a clerk the day prior, there isn’t a whole lot I can add, but it’s interesting to read of how the CME embarked into the process and transformed into a NYSE listing. It’s been a long while since my last post and apologies for the lack of posts for almost a year at this point. Trading the volatility of the Trump victory, combined with my daughter being such an energetic toddler, a few other serious hobbies, lots of travel and the never ending tinkering with trading software just didn’t leave me enough mental bandwidth to do a whole lot of the trading pit history stuff. But I’m starting to warm back up to getting some posts going again over time cause there’s still a lot of trading pit related history which needs to be shared! 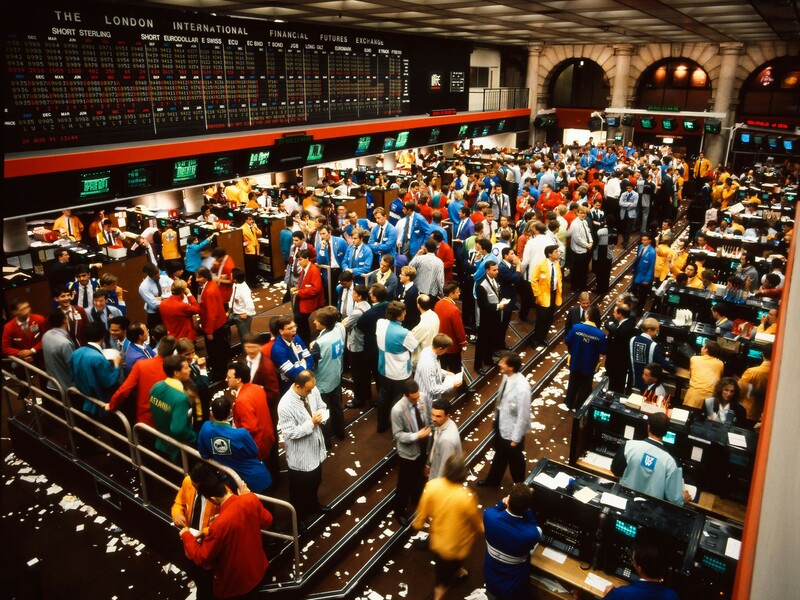 I’ve been meaning to post the above photo of the LIFFE trading floor at the Royal Exchange in 1991 because it really captures the mood of summer trading with nothing going on in the markets. 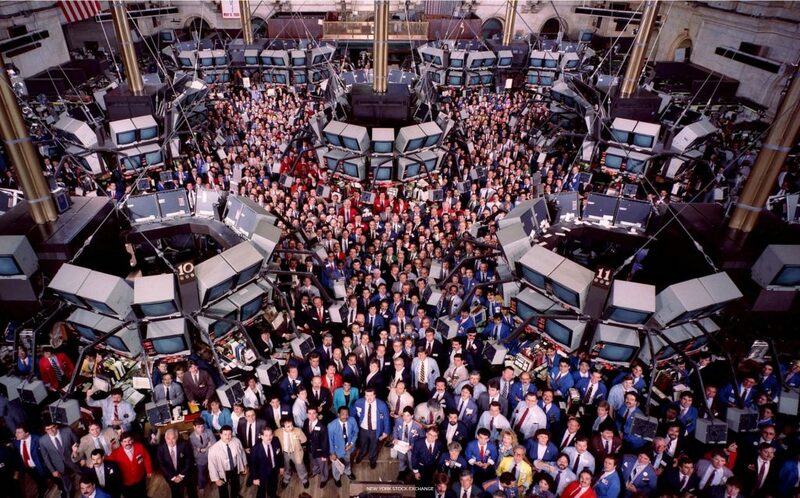 Enlarge the photo and you can see that not one trade is happening in the middle of the day (Tuesday, August 20th, 1991 at 1:44PM) and even though the trading pits are often over sensationalized with chaos, a lot of the sessions consisted of mostly standing around joking or silently contemplating one’s trading position. What I assume to be an unintended juxtaposition, the photographer captured the normally raucous trading floor at one of the slowest times of the year as it was after the Asian session closed, also after the London lunch break, before the US bond market open and most importantly at the height of summer holidays which leads to a seasonal nadir of volumes. While I can attest to never really understanding most art, this photo is one of my personal favorites because it gives a very candid perspective on what the trading floor was often really like and it’s possible to isolate the individuals throughout the broad trading floor population. In particular, because there wasn’t anything really trading at the moment, I appreciate that the photo allowed the perspective of how the individuals interact or stay within their own thoughts while awaiting the next bit of activity. As a comparison, Gursky really minimized the individual in all his (vastly overrated, imho) exchange photos to emphasize the scale of the trading floor instead. Above is a couple minute clip from the BBC which was recently uploaded about LIFFE’s shift from the Royal Exchange to it’s larger trading floor at Cannon Bridge in late 1991. Every time I visit London, I always walk through the Royal Exchange and it’s hard to believe that it was once home to trading pits but like the rest of the industry, adapted by transformation into optimal use, in it’s case a retail development. Towards the end of the clip, there is mention of “Essex Man” which, as an American I had to have explained to me in the past, and the closest American equivalent I’d compare it to would be someone from New Jersey.